One of the most famous parables that Jesus ever told was the story of the prodigal son. It’s the story of a son who demanded his share of his father’s inheritance. The son then goes off to a distant country and squanders all of his wealth with loose living. Only when he reaches his lowest does he consider returning home. In the surprise of the story, his father not only receives him back home, but celebrates the return of his son who was lost and was now found. Many sinful men and women have found great comfort in this story, knowing that God is like the father, who will receive repentant sinners (Luke 15:11-32). This story is often called, “The Prodigal Son” and rightly so. 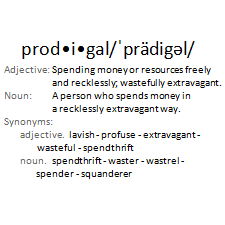 Prodigal describes the one who recklessly spends money extravagantly. This is certainly true of the son who left with half of his father’s estate. However, in many ways, this story could easily be called, “The Prodigal God.” The father of the story is wasteful with his mercy. He freely gives half of his estate to his wayward son. It was no surprise that he wasted all of the wealth. Yet, the father freely gave. And when the son returned, the father didn’t demand any sort of payment or restitution. Instead, he lavished his grace and mercy upon his son. This is a great picture of our God. He is “wasteful” in His mercy. He extends it to undeserving people, like you an me. Praise the Lord for our prodigal God. I recently heard someone tell of their observations of life. They observed that life appears to go by as quickly as your age. For instance, when you are 10 years old, you seem to be travelling through life at 10 miles an hour. But, when you are 45 years old, life seems to be going by at 45 miles an hour. 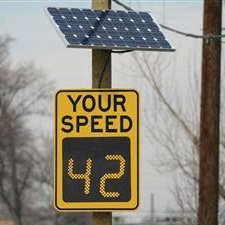 When one reaches the 70’s, surely they are over the speed limit. This observation has certainly been true of my experience in life. Each year seems to be going by faster and faster. It gets me thinking about my end. How soon it is coming? With each passing day, it draws closer and closer. Jesus told a parable about the man whose life came to a quick end. He had thought that life consisted of his possessions. He built barns and bigger barns to store his grain. Then, he planned to take his ease by eating, drinking and merry making in his retirement. Little did he know that his end came before he could enjoy his wealth. God said to him, “You fool! This very night your soul is required of you; and now who will own what you have prepared?” Jesus then comments, “So is the man who stores up treasure for himself, and is not rich toward God” (Luke 12:13-21). As you travel through this life faster and faster, are your storing up treasure for yourself? Or, are you becoming rich toward God? 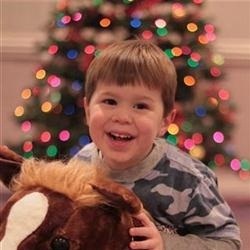 If one thing characterizes my four-year old son, it is his relentlessness. When he wants something, he will pursue it until he gets it. When he wants to play a game, he will ask and ask and ask to play. When he wants to show you something, he will get you and bring you to see what it is that has captured his attention. When he says something and isn’t heard, he will say it again and again. He will even grab your face and point it toward his own so that you will listen to what he says. We have much to learn from our relentless son, because God commends those who are relentless in their pursuit of Him. Jesus told the parable of a widow who continually came to the judge, seeking legal protection. Finally, the judge broke down because of her relentlessness (Luke 18:1-8). 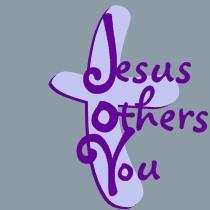 Jesus told another parable of the friend who knocks on the door and pleads with his friend to help him. When the friend first refused, he continued to ask with persistence. Finally, the friend gave in and helped him (Luke 11:5-8). Our God is a good God who will give us good things, if we but ask. Jesus said, “Ask and it will be given to you; seek, and you will find; knock, and it will be opened to you” (Luke 11:8). Are you relentless in “following hard” after God? (Psalm 63:8, KJV). This past Wednesday, the former governor of Illinois, Rod Blagojevich, was sentenced to 14 years in jail for the 18 criminal counts against him, including the attempt to sell the senate seat vacated by President Obama. That makes four of the last nine governors of Illinois to spend time in prison for crimes. It doesn’t bode too well for Illinois. These words sound like repentance. But, because of their timing, they seem to demonstrate only his remorse at the punishment about to be handed down. Perhaps he was seeking a bit of mercy. How different it may have been if Blagojevich would have spoken these words three years ago! 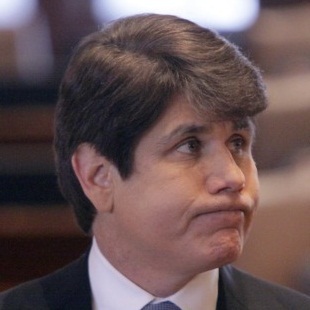 I do not simply want to point the finger at Blagojevich. I want to use his example to press into our lives. Are you sorrowful for your sin long before anyone finds out about it? Or, is your sorrow manifest only when the consequences of your sin begin to hurt you? God calls us to repent from our sin, rather than merely fealing remorseful over the effects of our sin. The good news is that God will forgive all who repent from their sin (see Luke 24:47). Some things that happen here on earth are so glorious, that heaven watches and rejoices in them. What are these events, you ask? A royal wedding? A Superbowl? Election returns? No. Heaven pays attention to those events that many on earth have no interest. It’s the conversion of a sinner. Jesus said, “There is joy before the angels of God over one sinner who repents” (Luke 15:10). Let’s rejoice in the truly glorious events that take place here upon the earth. Everyone is seeking after their own happiness. The problem is that many are seeking after it the wrong way. Usually, they seek it by putting themselves first and pursuing their own pleasures. But, this isn’t the path to true joy. True joy comes when you place Jesus first in your life. “Whoever comes to me I will never cast out” (John 6:37). True joy comes when you serve others. “Whoever would be great among you must be your servant” (Mark 10:43). True joy comes when you “deny yourself, take up your cross and follow Jesus” (Luke 14:23).